Location is a fundamental aspect of spatial planning. It is subject to, and the result of, planning activities. It is therefore not surprising that the first incentives for the development of tools for spatial data management and spatial analysis came from professionals who were engaged in spatial planning. 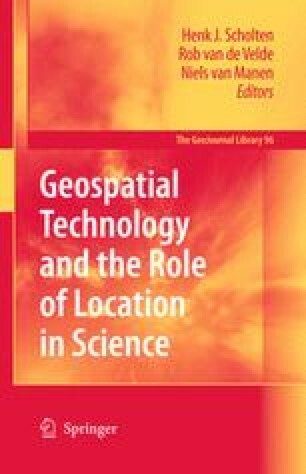 This chapter describes the development and interaction between the evolvement of spatial planning and the rapid development of Geo-ICT in the past decades. This is illustrated with examples of Geo-ICT applications used for spatial planning over the years, from very basic land use models via more advanced models to integrated systems supporting discussion and decision making. Key issues as the growing importance of the communicative aspects of planning processes and the concept of planning as a participatory process are adressed. Through the revolutionary development of internet technology along with geospatial technology new future crossroads between Geo-ICT and spatial planning are foreseen. Although Geo-ICT and spatial planning appear to be closely related interrelated in scientific development, it is stated that the use of Geo-ICT in spatial planning practice lags behind expectations. The key obstacles related to this in methodology, data and competences are reviewed. Bulmer, D. (2001). How can computer simulated visualizations of the built environment facilitate better public participation in the planning process? Online Planning Journal (http://www.onlineplanning.org), publication date November 13, 2001.